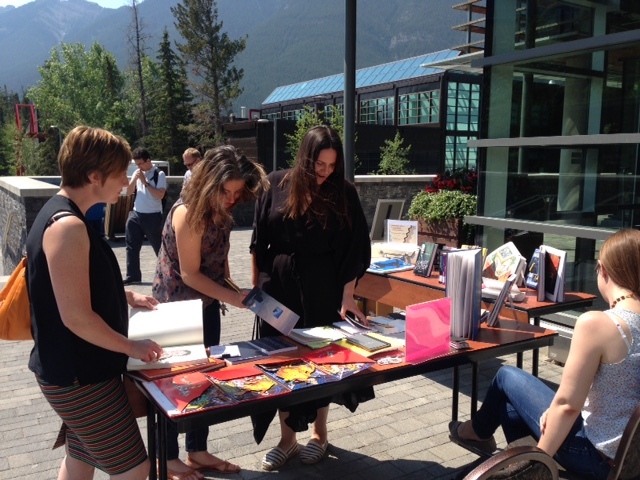 Introducing Banff Centre’s Pop-up Library! On July 9, 2015, the Paul D. Fleck Library & Archives introduced a new project which brought the library to you, Banff Centre Community! 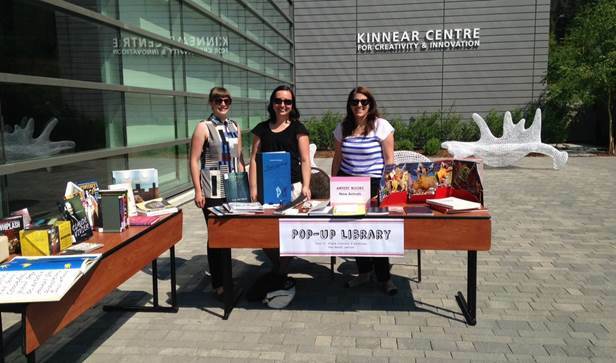 We set our Pop-Up Library in the Canada Plaza of the Kinnear Centre for Creativity and Innovation, where visitors had the opportunity to stop by and explore the wide range of our collections, find out about upcoming library programs, and library staff members were on-hand to take care of any questions at this alternate location. The pop-up is an increasingly popular trend in many different industries around the world. It is established when businesses, brands, community groups, and individuals temporarily set up spaces for the promotion or sharing of resources.The inspiration for our project came from other libraries organizing similar outreach projects, such as Read/Write Library’s BiblioTreka and Projet Mobilivre-Bookmobile project. While these are fundamentally more mobile ventures, the idea behind initiating a project like this is the same—it is all about discovery. Pop-ups give libraries the opportunity to enhance promotion of their specialized and perhaps hidden collections and to reach people who may not currently use the library. On display were some of our new books, magazines, artists’ books, DVDs, CDs, and even a preview of our new portable Crosley record player as a way to promote our then-upcoming event—a Happy Hour Artists’ Books Game Night and Listening Party. Many were surprised and delighted by the record player and prompted many to ask, “Do you have a record collection?” They were amazed that indeed we do, with just over 4,000 LPs. Behind us Brian Jungen’s sculptural benches The Ghosts on Top of My Head made for an wonderful outdoor reading lounge area. Visitors had the chance to sit and flip through some of our new arrivals—such as Misty Keasler’s Love Hotels: The Hidden Fantasy Rooms of Japan and David Horvitz’s How to Shoplift Books. At the very least we hope to make this initiative a more regular occurrence. One day in the near future you might see us pop-up in the other locations on Banff Centre campus. A selection of books and media from The Banff Centre Library including Claude Matisse's Jazz, a biography of composer Claude Vivier, the collected works of Beethoven on CD, and the Vancouver Art Gallery catalogue Raven Travelling: Two Centuries of Haida Art. Library staff were excited to work outside on this beautiful summer day. “This book was so good, I very seriously thought about stealing it.”—Andrea deBruijn, Printmaking Practicum, reading David Horvitz’s How to Shoplift Books. Photography Practicum Jenny Laiwint discovering new books at the pop-up library. 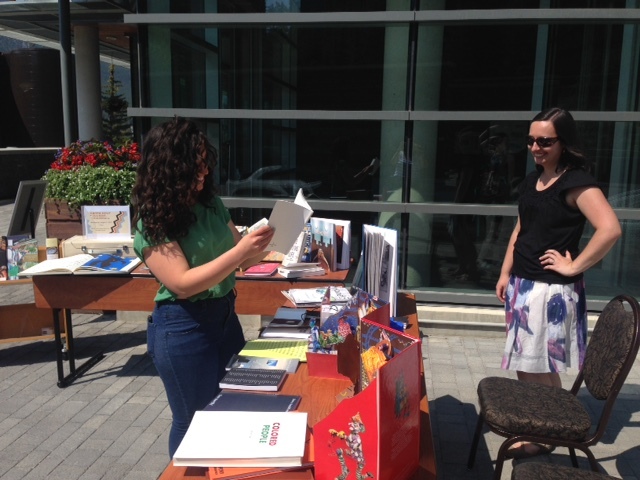 Visual + Digital Arts staff exploring the artists' books at the pop-up library. Our staff couldn't resist reading the books too.